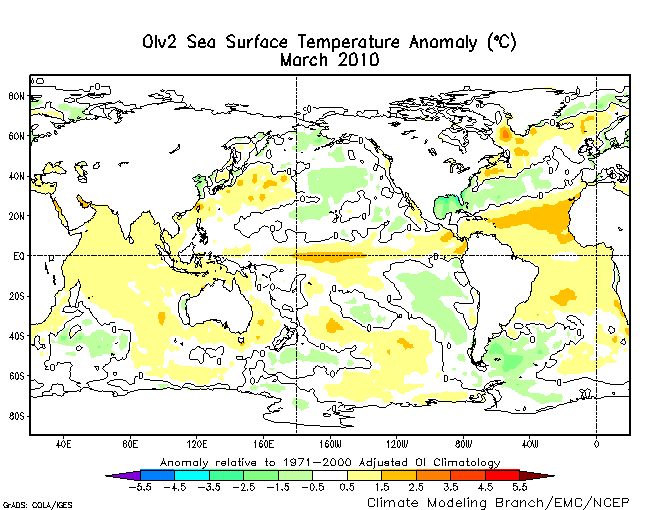 March Global Sea Surface Temperatures | Wott's Up With That? “March Global Sea Surface Temperatures“. Bob Tisdale posts a whack of charts and plots derived from NOAA’s National Operational Model Archive & Distribution System (NOMADS) data. Not much interpretation though, maybe because the temperature trends seem to be upward. I’m scratching my head over the difference between these two versions of the March Global SST Anomalies. Similar, but somehow Bob’s version minimizes the orangey bits. Bob Tisdale's version of the March 2010 SST anomalies. NOAA's version of the March 2010 SST anomalies. This entry was posted in Just Keep Saying It and tagged El Niño, SST Anomalies by Ben. Bookmark the permalink. Nope. There was no interpretation because my post was simply a monthly update of the graphs of the individual ocean basins. Interpretations and discussions of the variability in the individual ocean basins can be found using the search function at my blog. Are the differences you perceive in the data or simply differences in presentation and the scaling? To provide information, visually. Why do the global temperature suppliers break their data down into subsets by hemisphere and latitude bands? To provide information. Why does GISS divide its annual mean data in two subsets, January through December and December through November? To provide information for those seeking it. If you were to open the NOMADS link I provided earlier and select “Monthly OIv2 SST” and “map” before clicking on next page, you find two adjustments for varying the scaling of the anomaly maps: “Contour interval for var1” and “white.” The contour intervals (0.5) and the temperature anomaly at which the white appears (0) in the map I posted and version you found are the same. There are no other adjustments for me to employ to “minimize the warming anomaly”, so your speculation that I’ve somehow suppressed the warm anomalies is unfounded. [Looking at the two charts closely I now see that the main difference from the version NOAA posted, other than using a stronger blue color for cool anomalies rather than pale green, is that there is an overlaid zero contour. This visually “fills” the white space. When you re-plotted the data you made different choices, which intentionally or not introduces bias. My monthly posts on SST anomalies have nothing to do with the climate debate. They are illustrations of data. Also, the NCDC does not provide graphs of individual ocean basin SST anomalies, so I am not “simply reposting” them. Perform a Google image search for “North Atlantic SST anomalies”. Whose graphs do you see? Try it with “South Atlantic SST anomalies”, “South Pacific SST anomalies”, “North Pacific SST anomalies”, “Indian Ocean SST anomalies”. Whose graphs do you see? The reason I started posting SST anomaly graphs is because there were very few, and most were not current.